I couldn't resist....I loved yesterday's painting so much, I had to paint another one and this time with 2 houses. It just seemed right. So, then. I originally had big blogging plans for today to share some more fun stuff with you, but the day has completely gotten away from me. That and I ended up drinking decaf coffee all morning like it was herbal tea and all I can say is that someone should really tell you that decaf coffee DOES has caffeine enough for me to have fierce caffeine headache. How did I not know this?! Yikes. Seriously, you did not want to bump into me at the post office just now :) Alrighty then, I'm off to finish up some things before we head off to a Groundlings show tonight for some much needed laughter!!!!! happy, happy weekend and maybe I'll pop back in and say hello before the weekend is up, otherwise I'll see you in a couple of days when I'm fresh and not quite soooo agitated, I mean caffeinated. *Edit* Sunday, June 1 (happy June by the way, does this mean summer is here!!??) for some reason my comments were off on this post for the last 2 days. I'm sorry, I didn't mean to shut anyone out in case you had something to say, so I switched them back on :) I'll be back tomorrow! have a lovely Sunday evening. Ok, plain and simple this little fellow was inspired by a recent call for entries for a show that not only am I excited to submit my work to, but also to share with you, in case you might be inspired to submit your creations as well! It's titled "Birds + Their Dwellings", and it's hosted by the San Francisco Museum of Craft and Design. Turns out that a long time blog visitor, Raymond, aka Bacchus, just happens to be the store manager of SFMC+D and he recently let me know about the show and asked me to spread the word. Raymond writes " We are looking for artists in all mediums (ceramics, stationery, jewelry, wood, print, metal, fiber and glass) to submit work for the show, all pieces which will be for sale. The deadline for entry is July 10th." You can find more details here and download the entry form. You can also feel free to email Raymond if you have any additional questions. You've probably already gathered that I like birds around here, so needless to say I'm completely intrigued by this show idea, and can hardly wait to create something special. Also happy birthday today, to two of my most lovely friends, Gena Kay and Karin (who just recently started blogging)!! (original is sold) ~ this one sold super fast (before I could even get this post up) and since it is super cute, I also had to make it into a print! My very first blog giveaway win! And considering I was one of 5 who won out of 849 comments (before the comments had to be closed), that's almost a little like winning the lottery! Especially since I won a fabric giveaway, such perfect timing with my present sewing adventures, from one of my favorite artists! I've been meaning to mention Emily Martin of "inside a black apple" fame so many times here on the blog. And really I think I've postponed it because there's just so much to say about this lovely lady I don't really know where to begin. And as I've mentioned before sometimes when I feel overwhelmed with what to say, I end saying nothing :) But eventually I do get around to it and today's the day. First I want to say thank you to Emily for this wonderful giftie! I received her bundle of fabric in the mail this week, including buttons, a beautiful postcard with one of my expressions of choice, as you know, "you are lovely", and the best part a sweet little handwritten note that says "happy making". As busy as this creative lady must be, to take the time to send out these thoughtful packages is so kind. And when I say "busy", that is an understatement. I honestly don't know how Emily does it all but as one of her many daily blog visitors, I see that somehow she manages, and she manages beautifully. To say she is an inspiration is also an understatement. There isn't anything that Emily can't create and everything she does create from paintings, drawings, dolls, stationery, sculpeys, t-shirts, tea towels, and on and on and on is so delightful and charming ~ you can't help but want to have one if not many of her creations at home with you, which is why everything sells out in minutes in her monthly updates at her Etsy shop. So if you want to start collecting her work, you gotta move fast on Etsy!! I was fast enough last year and bought one of her "Sophie" dolls, and now Sophie sits across from me in my studio, flanked by my bla bla cat and red ozzie rabbit by le train fantome (another artist who's creations I adore!). While I've never met Emily in person, I can only imagine that she must be as kind as she seems. 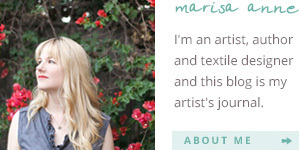 Her blog is one of my favorite daily reads, not only for the constant creative inspiration (she certainly has inspired me as an artist to try many different mediums in my creative expression) but also because after a year or so of reading it, I'm continually drawn to the genuine, giving and gracious voice behind it, not to mention a very savvy business woman at the ripe old age of 25. I've seen Emily handle a couple of touchy situations on her blog, and she always does so with honesty and grace. If you're an artist wanting to start a blog and you don't know where to begin, definitely visit Emily's blog. I find she manages the perfect balance of featuring her art, sharing details of her personal life with honesty, while still keeping her privacy, sharing useful sources and tidbits, recipies, music and movie recommendations, featuring other artists, and some posts that are purely creative expressions of hers ~ Each and every post is thoughtfully written with simply pretty photography. I imagine these are just some of the many reasons almost 1,000 people commented on her fabric giveaway. Did I mention that she also has very fun fashion sense? You can also visit Emily at her "fashiony blog", called some girls wander. While her self-described "cottage industry" is certainly beyond thriving, I'm sure this is just the beginning for Emily and the black apple and I am excited to see where it all goes for her. and before I forget, over the holiday weekend I made this apple pie recipe Emily shared on her blog, both the crust and the filling and it was DELICIOUS...definitely one of the best apple pies I've ever had! and to pass on the sentiment "happy making" to you on this creative thursday!! I'll be right back with today's painting! each is 10 x 10 in. I created these two famous friends for a special project that I hope to be sharing more details about soon! In the meantime, I've released these larger size paintings for sale just in case you might secretly be hoping for large paintings of your favorite characters. I let my daily painting subscribers know about these first and now I'm letting you know here at the blog. Also, I released this sweet little couple that I painted back in February. *Edit* Wednesday, May 28 ~ I've made this one a print over at the shop. The creating continued over the weekend...and it's been a while since I created a gocco print. So here's a little tuesday bear & owl for you, Oliver and I believe you know Oscar?! These prints are available at the shop and are a limited edition of 16 with 14 left. hope you had nice holiday weekend! Patrick: "Good morning Olive! Who are you going to be today?" Olive: "Why a giraffe, of course!" have a really happy holiday weekend filled with fabulous weather! 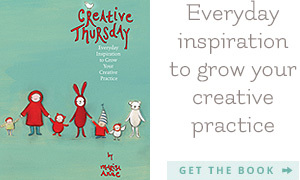 wishing you a happy creative thursday! you can find everything in this blog post right here! oscar and the sock monkeys 8 x 8 in. This creamsicle colored cutie (that color orange just makes me think "creamsicle") is one of 3 recent commissions I did for a completely delightful customer, Jeni, expecting her first baby. I wanted to share it with you A) because I think you will enjoy the cuteness :) and B) because this is a combination designed/requested by Jeni. She loved the "sock monkeys 3" and she loved oscar, so she requested they join each other in this painting with this particular orange background which works so beautifully with the little bit of blue in oscar. My FAVORITE combo right now, and I noticed Martha Stewart's as well, as it was adorning the cover of her May 2008 magazine. Just look at this painting next to "puppy dog" in the post below. It really just screams summer and makes me want to eat orange sherbert. I digress...the other reason I wanted to share this post, and this might seem obvious, especially if you're a regular blog visitor but C) I do take on commission paintings all the time, and I don't mind re-creating a painting that is already sold, especially if you have or had your heart set on a particular image I created ~ I don't mind customizing it for you like this example, colors, character requests etc. ~ more often than not I'm happy to make a print from my originals even if you don't see it listed over at Etsy ~ you can even make painting "requests" and if I feel inspired by your idea it might just show up in a daily painting... if you're order is a gift, just let me know and I'll gift wrap it for you and include a little card! What I'm saying is "don't hesitate to ask". At the end of the day, you, my customers, deserve to have a piece of art that you love, that inspires you, that makes you HAPPY!!! (oh and since I was complaining yesterday, you should know that it was cooler today! thank God ~ I just had to put on a little orange (of course) jacket this lovely pre-summer evening.) hope you are all having a good week! !